We’ve been building in the same ways since 1916, and they’re all expensive. 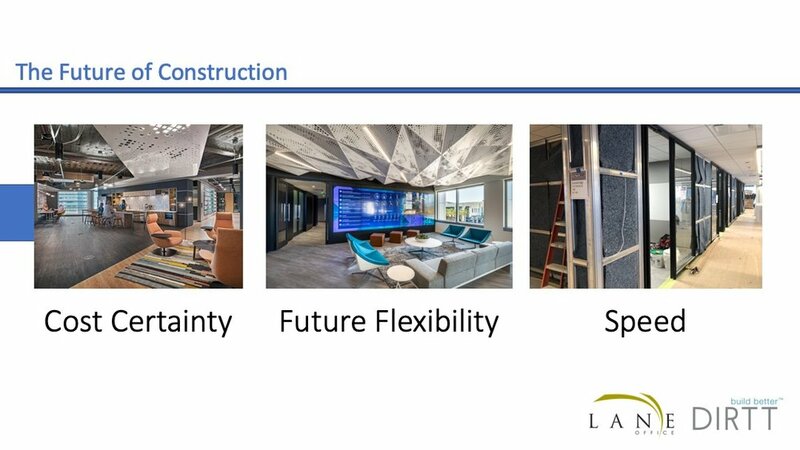 Laura Patel, Global Head of Partnerships for DIRTT takes us through the evolution of construction methodologies and how technology is able to solve for time and cost efficiency. My name is Laura Patel and I am one of your local DIRTTbags. 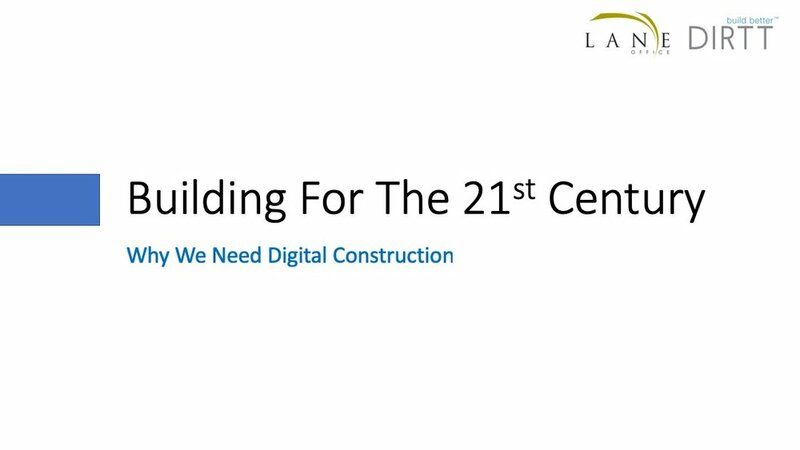 I work for DIRTT environmental solutions and this morning we're going to talk to you about construction for the 21st century and why we need digital construction. I gave a talk last week at the University of Buffalo, they asked me to come up and do a TED talk for some of the real estate community and their students. And in preparing for that TED talk, some of my research brought me to this postcard which is a postcard from 1890. So let that sink in. This is 126 years ago and in this postcard you can see that they predicted that by the year 2000, this is in 1890, we would have architects sitting in a fun little box somewhere far far away pushing buttons and through a series of mechanical levers and pulleys and robots, we would be building onsite, using no human beings. And at first I thought this is crazy. This is mind blowing to me that this is what they thought we would be doing in 126 years. And yet as I started to study this more, I realized that they actually got it half right. Because by the year 2000 we had started to make huge advances on the design side. We went from hundreds and hundreds of years of paper drawings to CAD in the 1970s through the 1990s and this introduced some process and some standardization to the design industry, whereas two drawing sets may have been dramatically different for the last couple of hundred years before that. 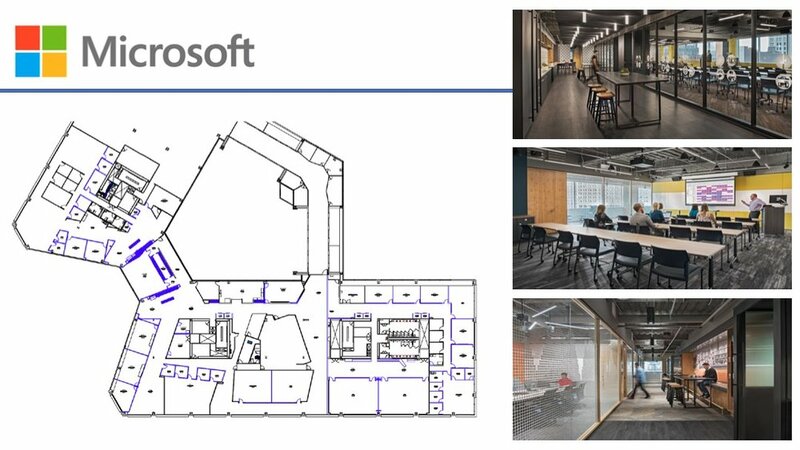 Then in the 90s we started to introduce different BIM technologies and this allowed for on the fly problem solving by smaller groups of teams, whereas making a building like this would have required dozens of people in the past to try and collaborate and figure out how to actually get this built. Then more recently, moving into the early 2000s up until today, we've obviously seen this onsurge of different design technologies that now allow us to actually visualize the space before it's even built. Yet, this is our graph for technological adoption in design. So a pretty steep curve and only getting steeper. If we contrast that with construction though it looks like this. This is a study by McKinsey and Company and you can see green is high adoption of technology red is low adoption of technology and for this study of McKinsey and Company polled 23 different industry sectors and if you scroll all the way to the bottom just above agriculture and hunting you'll find construction. So construction innovates only more than agriculture and hunting in terms of our adoption of technology in the process. And this is going back again about twenty five years of this study. I started to think about that and it's true if you look at any other industry, the automotive industry, electronics be that TVs, phones or even healthcare, we like to criticize healthcare but even healthcare has been disrupted multiple times over the last hundred years. Yet if you compare that with construction, we've actually been building the exact same way since about 1916. That was the last great innovation that's when drywall was invented everyone, 1916. Although design has come really far, we've gone from this to this. We're still building the same way which is resulting in what I like to call the Museum of fun things that happen in construction. The reality is they are all expensive and some of the research that I came across suggests that in the United States and Great Britain for every dollar we spend on construction about 34 cents of that dollar goes towards repairing mistakes that happen on site or towards different costs that arise from schedule overruns related to again, mistakes, miscommunications or challenges throughout the process. And that might not seem like a big number but when you start to factor that into the overall construction that happens annually it actually works out to about 140 billion dollars in wasted money because we are again, not using construction in this process. So how can we use 21st century construction technologies to help bring us into this century and build better? Meet DIRTT. Now I'm going to talk about how we're taking all of that sophisticated design intelligence and we're actually bringing that one step further into the construction process. So we do that using a really sophisticated pre-construction design technology and it's doing four really important things for us. The first is that it's actually connecting all of the different platforms in one software. So rather than having your architect who's then trying to communicate via paper to the subcontractors how to build the space, this is actually automating between a 3-D view and a 2D view, all of our elevations plan details everything is being sort of streamlined into this one platform. The second thing it's doing is it's engineering the entire building and all of the assemblies that we are producing, it's engineering them custom to a thousandth of an inch. So we never build the same things twice. Just like your general contractor never does. Everything is custom to a thousandth of an inch. And the way we do that is the software is actually behind the scenes doing all that heavy lifting for us. The third thing it's doing so we're engineering it we know it's buildable we're seeing it visually which really helps with the decision making process and we are also streamlining again the backend deliverables out to the design community. But the third thing it's doing is it's pricing everything in real time to the set. So I never have to call my client and say really sorry, but actually it's going to cost us another four thousand dollars or fifty thousand dollars. I know immediately what that cost is and this isn't a high level budget, this is my actual cost to the client. And the last thing it's doing which is the coolest part is as soon as my client says I love the way it looks, that meets my budget and you haven't told me that I can't build it. It's actually written all of the A.I. 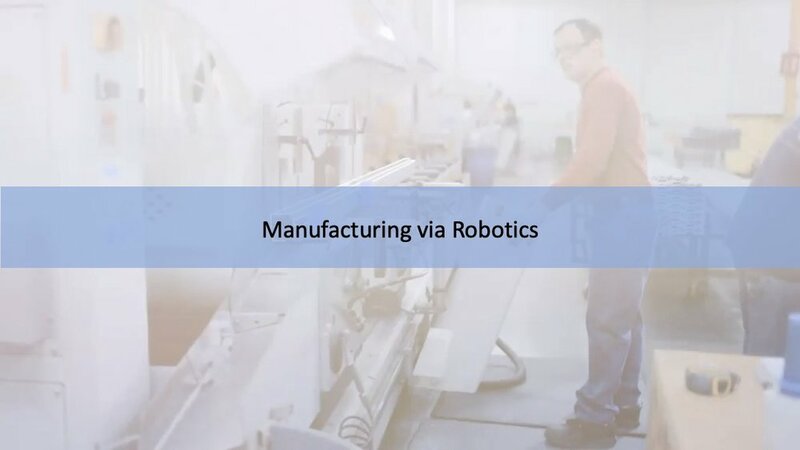 required for us to go to work within minutes and start to build every part and piece offsite using robotics and manufacturing. So taking all of that design intelligence and now actually having it produce all of your building materials. So how does it look once we get on site? Well it starts to make the construction industry a lot more akin to what we do in the automotive industry. We're not bringing raw materials to site and then having Joe and his friends hopefully construct the space in a way that reflects the drawings, we're actually producing it all in a factory. And it's coming to site and clicking together kind of like Legos. So everything from the Electrical to the data whether that's Cat 6 or fiber through to all of the wall assemblies which are going to be stood on site and zip together, nothing's being cut or finished or sanded. Those come equipped with whatever they need to from a technology standpoint, with plumbing, with data, with electrical. We're going to level the frames because buildings are never quite straight and then make all of those above ceiling connections that we first installed, install any integrated technology that needs to go within the cavity of those walls and then snap the tiles on and we're done. So I'm going to walk you through three case studies just to try and land this and show you some examples of the work that we're doing in the U.S. specifically we're a 400 million dollar firm and we operate in 11 countries, the U.S. is our biggest market. Saudi Arabia is actually our second biggest market with Canada coming in third. I'm going to focus on three projects in the U.S. 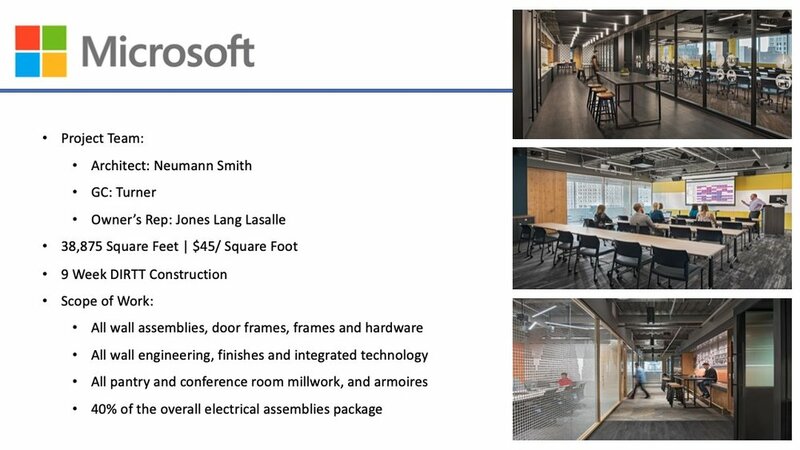 So this is Microsoft's offices in Detroit Michigan. We finished this six months ago a couple of quick highlights and photos from the project you can kind of see the scope of work here so a pretty densely constructed space everything highlighted in blue is DIRTT, along with all of the casework and millwork in the pantry areas and highlights of the scope of construction. So this was about a 40000 square foot space. Our multiyear trade umbrella was forty five dollars a square foot and we had a nine week construction timeline for our scope of work. What was in our scope of work was all of the wall assemblies that you saw highlighted which was all of the interior wall assemblies we didn't do any of the core of the perimeter, all of the wall engineering so that's the acoustical treatment, the blocking any of the utility that was running through the walls. All of the finishes and then integrated technology. 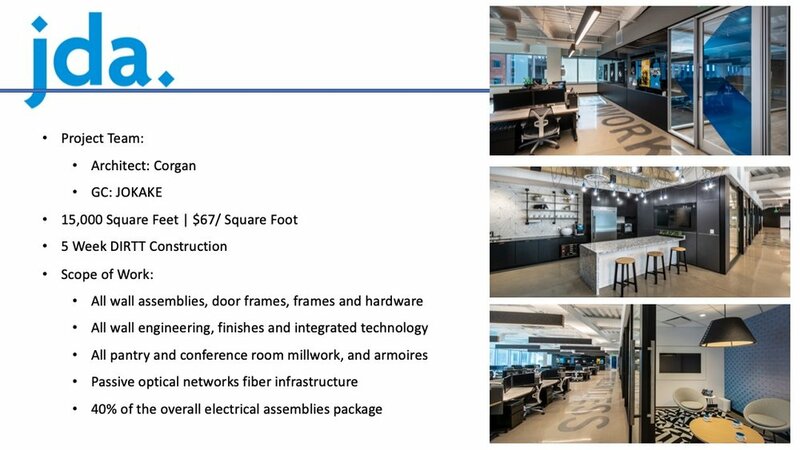 We also did all of the pantries and conference room millwork, all of the arm wires and then we took over 40% of the electrical package on this project. Second project JDA Software in Phoenix. Again some quick project highlights quite a bit more open plan in this project but a ton of technology, they had about 25 integrated monitors throughout the space. They are a software companies so they really wanted this to be a reflection of the fact that they are a tech firm. And some highlights here, 15,000 square feet this was $67 a square foot for our scope of construction and a five week construction schedule for us. Very similar scope of work except that we also did passive optical networks on this job. So we were providing all of their network infrastructure including the backbone to the building. 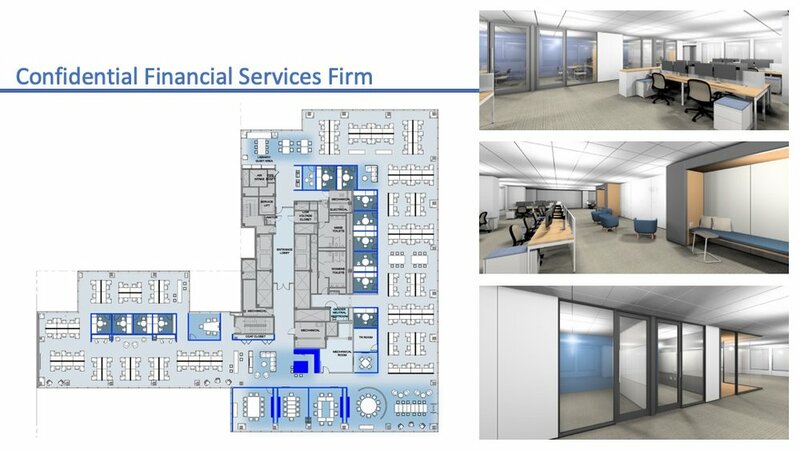 And then the last project which I can't say the name of but is a confidential financial services firm here in New York City that we're working on some project highlights on that. This is just in construction so I'm just including some renderings and this is a typical floor plan. 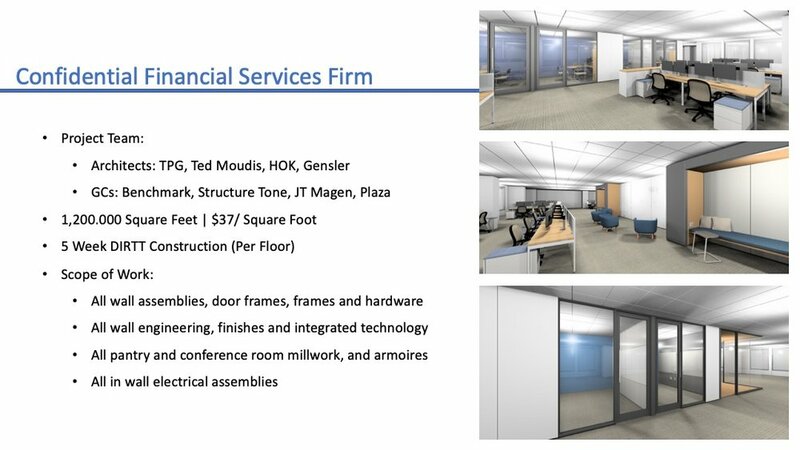 We're working with four different architecture firms and for GC's because we are building one point two million square feet in six months so there weren't enough people at each of these firms they couldn't award it to one firm. But they did award it to us as a turnkey prefab method. In order for them to meet their schedule our cost is about $37 a square foot depending on the floor plate. Each building is different. And we have a five week per floor construction schedule, largely very similar scope of work as the other buildings but we're only providing partial electrical assemblies because of the code limitations in New York and we're not doing any data here. So to summarize this is probably a lot of what you guys are currently going through with your existing construction process. You have a lot of uncertainty, you never know exactly what you're gonna get, exactly how much it's going to cost or exactly how long it's going to take and hopefully I've given you some food for thought on how you could be using digital construction and 21st century construction methods to be able to provide cost certainty schedule certainty and ultimately future proof your space. Thank you. 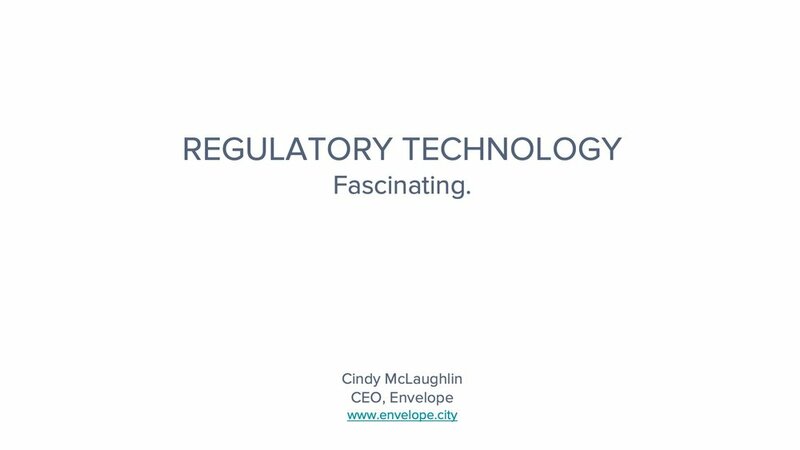 Cindy McLaughlin, CEO of Envelope discusses the challenges of navigating the current regulatory climate and how technology will level the acquisitions playing field, allowing mom and pop developers to acquire buildings better, faster, and with more information. My name is Cindy McLaughlin and I'm the CEO of Envelope. Somebody pretty smart on Twitter once said that technology is really good at taking what was once available only to the mega rich and bringing it down to the rest of us. So you have a vacation home in every city through Airbnb, you've got a personal driver through Uber, and you're in your bedroom is an in-home movie theater through Netflix. I'm here today to talk a little bit about how regulatory technology can do the same thing for real estate acquisitions. I'm also hoping to convince you that I will admit that regulatory technology is not the most exciting topic, but it's not as boring as you might think. Before I start talking about regulation in real estate I want to start by pointing out that the vast majority of regulation is made by really thoughtful policy makers who have anti-corruption and safety in mind as well as managing growth and economic development. But as they say the road to hell is paved with good intentions. And regulation has a nasty habit of piling up. It happens because each new political administration has its own priorities that need to be encoded. It happens because you find loopholes that need to be closed and it happens because unintended consequences of prior regulation need new rules to dial them back. 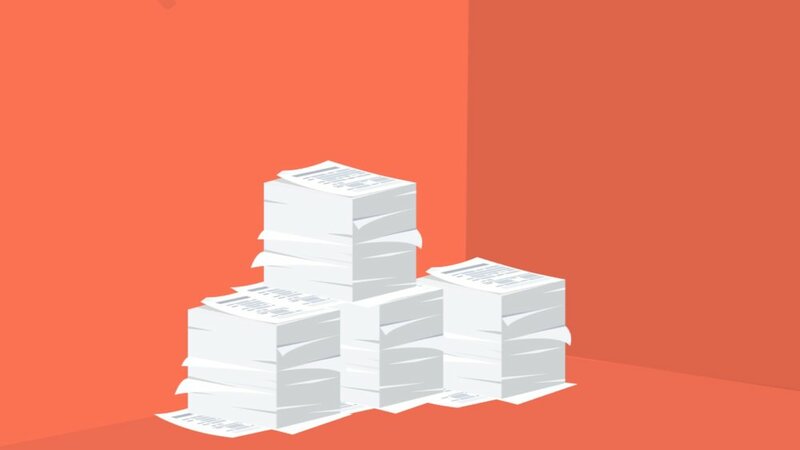 To get very concrete about the problem in New York City, the index for amendments alone and to the construction code are 400 pages single spaced. The building code is 35 chapters with 19 appendices. The zoning code is 4,000 of legal text. It fits inside one of those big boxes of printer paper. 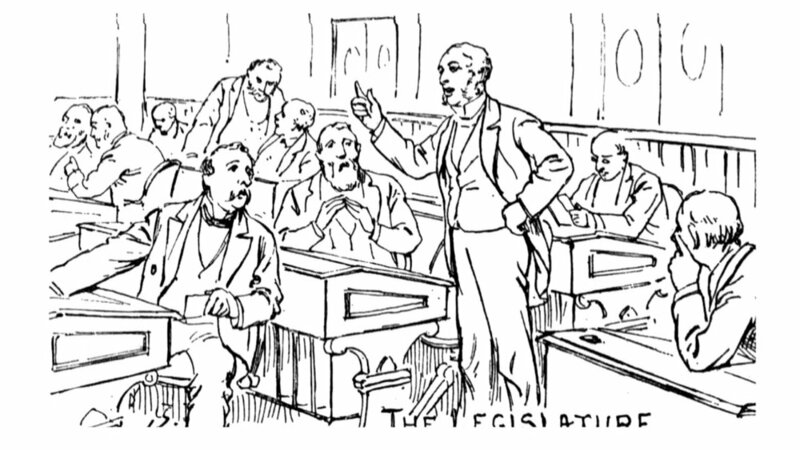 As you can imagine an enormous cottage industry of lawyers, lobbyists, consultants, advisers, have sprung up to help real estate industry professionals access, understand, navigate, sometimes evade and often times lobby to change the rules. I'm going to talk a little bit about zoning because it's the regulation that I know best. Practically speaking if you're a real estate developer in New York City and you want to know what's possible to build on a particular address you're probably going to call an architect or a zoning attorney. If they have time, they're probably going to print out the relevant portions of the zoning resolution with a highlighter pen. They're going to understand the rules and if they're fancy they're going to build a three dimensional model either hand drawn or they're going to build it in desktop software. They'll email it over to you, you'll take a look and you'll say, well what if I were to add a community facility to the ground floor of my building? Or what if I were to change the floor to floor height? What would happen. How much square footage could I get out of that building? And you're going to kick off a game of email ping pong that can take days or weeks and can rack up fees between twenty five hundred dollars up to twenty five thousand dollars depending on the complexity of the development. Assuming that you're going to look at more than one property before you make an offer on a single one, you need to have a cool 25 to 50 thousand dollars sitting around just to explore your options. To put this kind of capital in context. The median income of New York City households is fifty thousand dollars. So if you're an individual if you're a mom and pop development company you simply don't have the means to do smart real estate acquisition because you need to be able to do the level of analysis that I just addressed. But the big guys are very willing to pay. Like most good government tools zoning sounds boring, but it is in fact a secret means by which cities are shaped and fortunes are made. 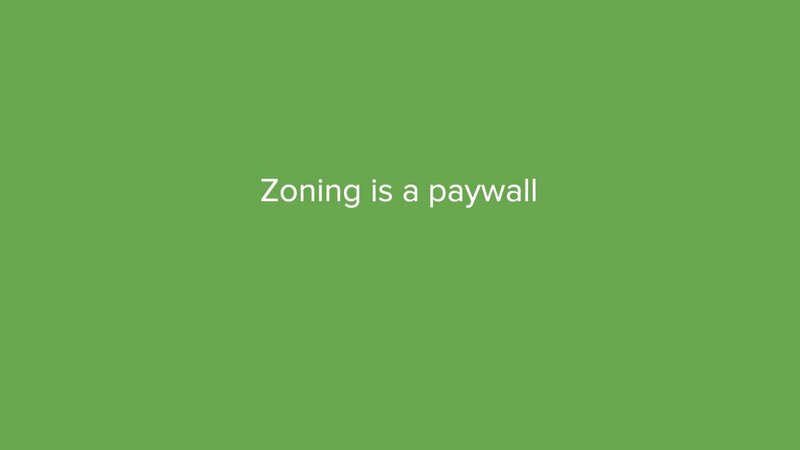 Zoning essentially serves as a paywall. Only those who can afford to navigate it can make their fortune in the industry it regulates. So circling back to the point of this talk, can regulatory technology help with this problem? I'm going to talk a little bit about my company envelope. There are companies like mine that are handling different portions of the regulation. We happen to be building the three building the 4,000 page zoning resolution into three dimensional software. To walk you through what the software is doing, we let you enter an address and very quickly we show you what's built there today and we show you what the three dimensional spatial constraints of zoning allow you to do. So where there are height limits, where there are setbacks, where there are yard requirements and we do that across all of the cellblock conditions of that particular parcel. We then make a recommendation as to the use type that's going to allow you to maximize your floor area. This is a commercial building. But you could play. 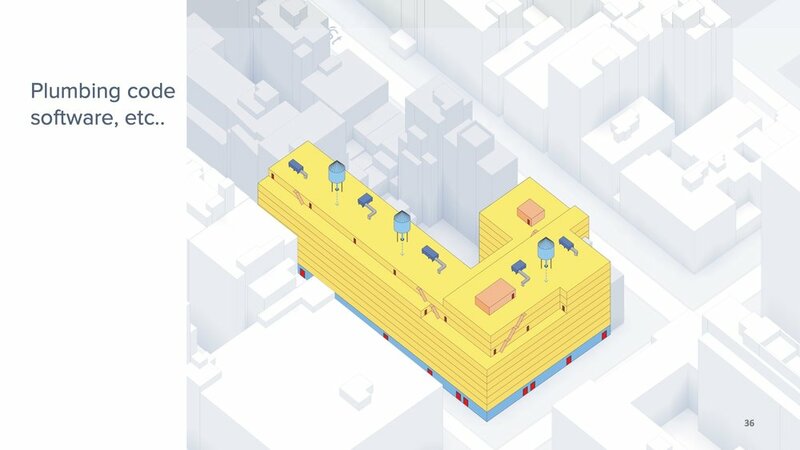 You could say what if I were to do a residential building with a commercial ground floor. Or have three floors of commercial. Or what if I were to change my floor to floor height, how much extra extra square footage could I get out of my building. Or what if I were to take that inclusionary housing bonus that happens to be available on that parcel. 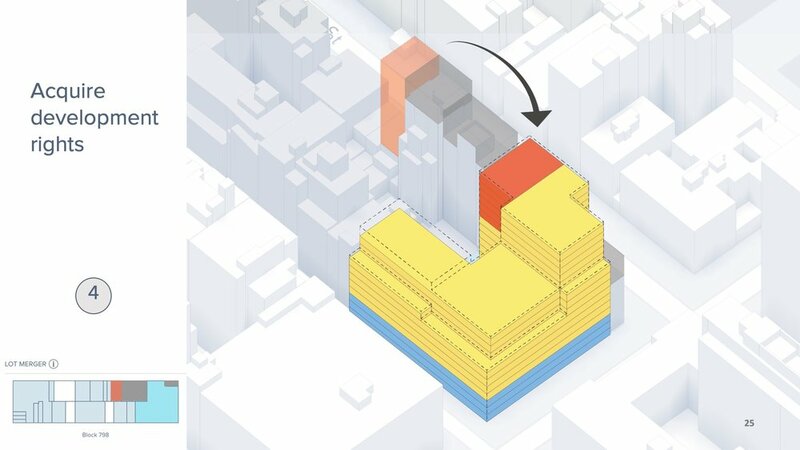 Or add air rights from my neighbor or my other neighbor. And what if I were to caterpiller my way around the block until I can fill out the zoning envelope. What would happen if I were to add dormers to get a little bit of extra square footage. And anything I can do on a single lot. I want to be able to do across multiple adjacent lots as an assemblage. 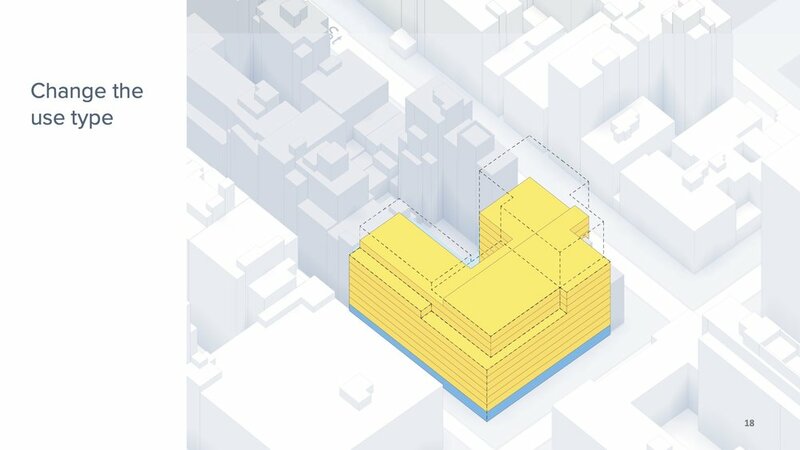 In essence we're building sim city for real life, trying to take the wild complexity of zoning and build it into something that's accessible, useful and even kind of beautiful. Companies like mine have started out working with industry because frankly, they're the ones who can pay us in a way that we can invest back in our technology but eventually we hope to be able to provide our software so cheap or free so that anybody who has a parcel of land can understand how to maximize the value or the productivity of that parcel. They might find air rights that they didn't know they had that they could sell to their neighbor and it would allow them to speculate themselves on other lots for investment properties. Regulatory software is pretty siloed. We do zoning, it's our area of expertise. 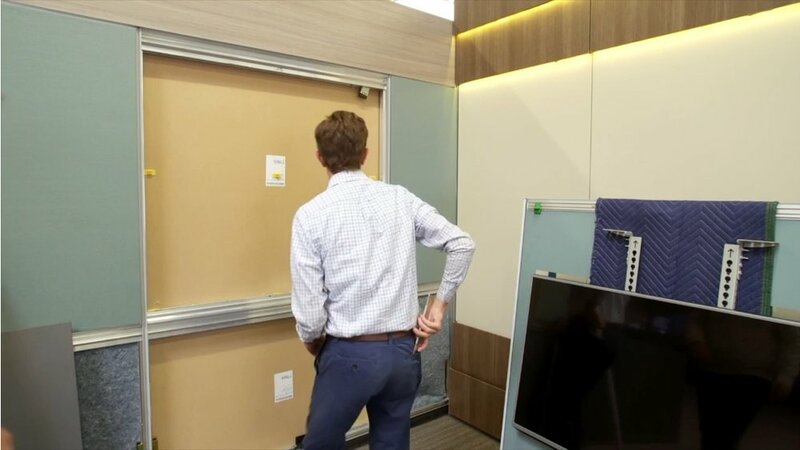 Somebody else does building codes, somebody else does mechanical code, but in the not too distant future, we're all going to be holding hands. And well we're showing you what you could build in terms of square footage. 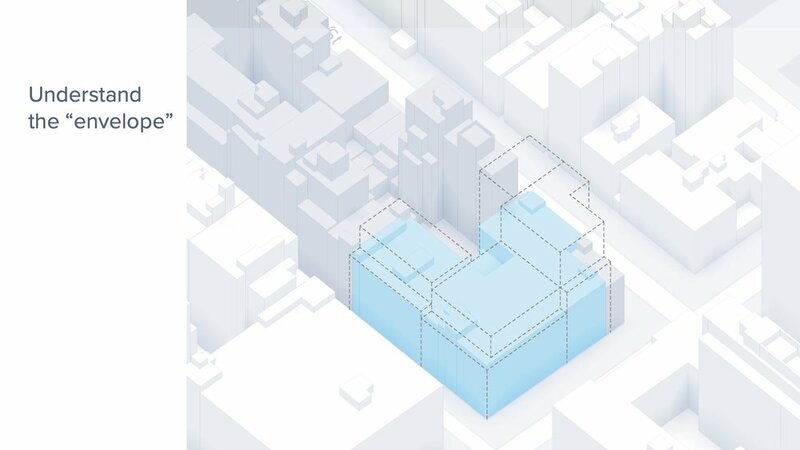 We'll be partnering with companies that are already building in three dimensions, the building code that shows you the egresses and and mechanical code, and plumbing code software. And eventually will form in three dimensions a regulatory scaffolding that will allow you as a potential acquirer to say, very quickly, what are the bones of my development going to look like, what is this going to take and is it worth it for me to acquire this parcel. In this way we think that regulatory software is going to level the playing field in acquisitions allowing mom and pops to be able to do the same kind of exploration as the big guys. We're going to try to make this industry a little bit more fair and a little bit less rigged in favor of the very wealthy. Thank you very much.